Many of the yews that exist in our churchyards are widely held to pre-date the Christian consecration of the church site. This exaggeration has its roots in Victorian guidebooks and wishful local histories. Such yews do exist in British churchyards, but investigations by the Ancient Yew Group (AYG) show that while the myths surrounding them are many, pre-Christian yews themselves are relatively few. Many of our oldest churchyard yews were planted around the time of the original Christian consecration of the churchyards in which they stand. Such ‘consecration yews’ are integral to their site, and stand as witness to all that has happened at the church of which they are part, familiar to all who ever set foot there. Some consecration yews original Saxon or Norman trees, others are of a later date depending on the era of the first Christian building on the site. Important renovations also seem to have triggered yew plantings and some fall into this category. 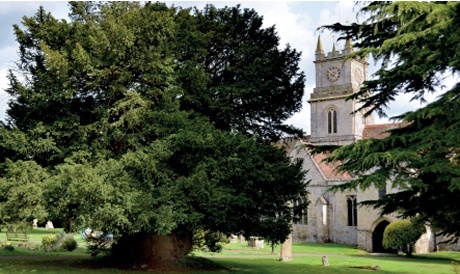 The oldest consecration yews are up to 1,400 years old. Although we do not know exactly why (there are many theories), it is evident that the planting of yews has been a part of site consecration throughout Christian history in Britain – a tradition that continues today. The AYG contends that consecration yews should be treated as artefacts of historic significance equal to that of other original parts of the church building and its setting. The fragmented but self-supporting shell of the immensely ancient yew at Farringdon Churchyard in Hampshire: it remains almost unchanged in girth (9m or 30 feet) since it was measured by Gilbert White about 1789. As for those yews which do seem to pre-date Christianity, these are rare, staggeringly important in national or even international terms, immensely interesting and most exceptional. A few such specimens are mentioned below. 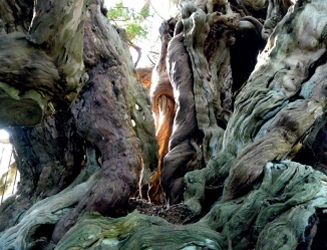 Knowing a yew’s age is key to understanding its historical significance. It is understandable that some might query the AYG’s age estimates because these sometimes conflict with previous efforts to date a particular tree. Even after 200 years the science of yew dating remains in some turmoil. The chief problem is that the oldest yews are hollow. Through the centuries broken branches and injuries to the trunk allow access to bacteria and fungi which cause rot to begin in the wood at the centre of the tree. This rotting is almost inevitable over the huge lifespan of the yew, and because yew wood is exceptionally strong and flexible does not harm the living parts of the tree as it often does other species. However, because the oldest wood is missing, radiocarbon and dendrochronological investigations cannot be definitive. A case in point is the Defynnog yew in Powys. In July 2014 several national newspapers carried articles claiming that this particular yew (or pair of yews) was 5,000 years old. However, when the Ancient Yew Group examined the evidence, it was found to be pseudo-scientific and highly selective, relying solely on evidence which appeared to support the inflated age while ignoring important evidence which refuted it. (Details of the case are available on the AYG website). Unconvincing claims like this have been common in the past but as the AYG continues its cataloguing and statistical dating work, a clearer and more scientific picture of our oldest trees is emerging. Using the firm knowledge it has gathered, the Ancient Yew Group has produced a list of all the known significant yews in Britain. Every yew on the list is considered particularly worthy of careful protection and is rated ‘ancient’, ‘veteran’ or simply ‘notable’. Just over 1,000 churchyards in England contain AYG-listed yews, and 154 of them contain ancient specimens. In Wales there are nearly 350 churchyards with yews of note, and of these 84 contain ancient trees. While the list of notable yews remains a work in progress, the group believes it has covered almost all churchyards which have an ancient or veteran yew, and the information for each church and diocese is freely available on the AYG website. A simple means of assessment is to measure the girth of the yew’s trunk at its narrowest point. If it exceeds – or is known in the past to have exceeded – five metres in girth, the tree is likely to be veteran. If the girth exceeds seven metres then it is probably ancient. Sometimes it can be demonstrated that smaller yews are likely to be veteran or ancient. If you have a large unlisted yew, please contact the AYG via its website and a specialist will come and assess it. As they progress through various life stages old yews come to the attention of those responsible for churchyard maintenance. Some individual yews are explored below exemplifying problems and maintenance issues and solutions. 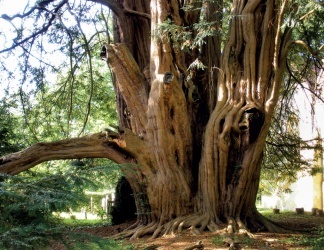 Among the yews which can be considered for pre-Christian status is the large yew in the churchyard at Tandridge, first documented in A Topographical History of Surrey by EW Brayley (1841): ‘At the west end, is a large decayed yew-tree, split into four or five parts, and in a state of rapid decay. At five feet [1.5 metres] from the ground, its circumference is nearly thirty feet [9.1 metres]’. Above left: the vast yew at Tandridge churchyard in Surrey. 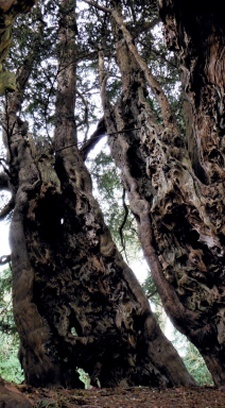 Above right: the extraordinary complexity of the Crowhurst yew in Sussex has developed over two millennia or more, making the tree unique and irreplaceable. Although reported to be in a state of serious decay in 1841 the tree survived and now flourishes as one of the best and most spectacular specimens in the world. The lesson of history is that very old yews can regenerate satisfactorily, and seemingly irreversible decay and destruction of parts are incidents which, in the long-term, the organism takes in its stride. The Tandridge yew’s base circumference was less than 10.5m when recorded in 1890, and in the last 125 years it has increased during the flush of regeneration by 53cm to nearly 11m. This increase is likely to be faster than the growth rate during the earlier period of decay when girth increase may have virtually stalled. The yew’s projected age exceeds two millennia, placing the tree in the illustrious company of yews at Farringdon and Breamore in Hampshire, the two Crowhursts in Sussex and Surrey, Herstmonceaux in Sussex, Ashbrittle in Somerset, Norbury in Shropshire, and Llangernyw, Discoed and Bettws Newydd in Wales among others. The Tandridge yew’s successful regeneration is very likely in large part due to the canopy being allowed to grow freely, and the fact that a fractured and subsided trunk section was allowed to grow out along the ground towards the lych gate. Around the time of the first world war when the tree had considerably recovered, most of the fallen trunk section was removed, but two substantial layers were sensibly left as by then it had established roots of its own. The result is that we now have new young trees that are genetically identical with the original. Here is a way forward in terms of a philosophy of maintenance. Yews have many survival mechanisms, and sometimes what looks to human eyes like a disaster may be one of these mechanisms in progress. On the whole, where there is no likelihood of damage to persons or property a yew should be left alone. There are occasional exceptions, however. At Long Sutton churchyard in Hampshire a hollow ancient yew has been effectively propped. The treatment here is an excellent example of best practice. The tree is so hollow that the ‘walls’ of the trunk are only barely capable of supporting the re-growth of branch material emanating from them and there were occasional losses, as in 2000 when a metre wide section of trunk fell when overloaded by snow. Another fallen section has long been allowed to lie in situ, where it continues to grow. A number of safe propping methods exist, at Wilmington in Sussex telegraph poles have been used to good effect, while at Long Sutton the props are squared timber with a footplate to prevent them from sinking into the ground, and rubber ties to prevent movement at the join between the prop and the branch. Propping should always be carried out by a qualified arboriculturist. Although trouble-free when done expertly, this work has potential hazards, not least that an incorrectly installed prop fails, causing damage or injuring someone. The safety of props needs regular review and an arboriculturist’s plan should detail such aftercare. From a procedural point of view, proposals to prop a branch should be treated as if the tree was to be cut and a faculty is required. Although inadvertent vandalism due to ill-advised arboricultural practice has been distressingly common in the past, thankfully deliberate vandalism is quite rare. Recent cases include a well-documented ancient yew at St Mary’s Church in Iffley, Oxon which has a good claim to being contemporary with the original Norman church. This tree was completely stripped of the bark on a major limb by local youths with nothing better to do. The only course in this instance is to remove the limb, which cannot recover without bark, and to instruct the local youths. At St Mary’s Church in Linton, Herefordshire a fire was set inside the hollow of the vast and venerable yew. Despite the ferocity of the blaze as the inner wood burned, the tree narrowly survived and now flourishes again, another cautionary tale regarding the inadvisability of removing damaged or declining yews. Nothing can stop vandals if they are absolutely bent on destruction, but some things can be done to reduce the risk of this kind of damage. Twiggy lower trunk growths are sharp and uninviting, mildly dangerous and often removed to show the shape of the trunk, but they do work rather well as an anti-vandal ‘coating’, so where the risk of vandal damage is present keeping such twigs should be considered. The churchyard of St George’s Church in Crowhurst, Sussex boasts one of the oldest yews in England, probably a pre-Christian tree. This specimen is surrounded by an iron railing, as is the huge yew at South Hayling in Hampshire. Fencing is a good solution for reducing footfall compaction of the rooting zone of the yew and eliminating casual vandalism but done properly it can be expensive. Ivy is not generally a problem for yews in the wild because the yew’s dense canopy and surrounding vegetation tends to shade it out. For yews managed by humans, however, it is a different story. Raised canopies and the clearing of undergrowth allow more light to the base of a yew, helping ivy to flourish. Ivy is a stealthy killer of old yews, once established in the canopy it will reduce the vigour of the tree through shading, and it can act like a sail, changing the wind balance and weight of upright sections which can lead to the tree being wind-felled. Ivy may be a great habitat, but if it is welcome in the churchyard it should be allowed to colonise less significant trees, not ancient yews. The greatest threat to historic yews has been unenlightened management. Damaging interventions include: felling ancient specimens because they were untidy or looked ‘ill’, filling hollow trunks with everything from concrete through foam filler to plastic bottles, weed killing with salts over the active rooting area, chopping the top of the tree off and hoping it will regenerate… the list goes on. unauthorised works to trees covered by tree protection orders or in churchyards which fall within conservation areas may lead to prosecution. Suffice it to say that humans with poisons, chainsaws and plastics in the recent past have represented the biggest threat to these trees, some of which have effectively looked after themselves since they were planted by Saxon or sometimes even older hands. Work should never be undertaken on an old yew without expert advice. At St Andrew’s Church in Totteridge stands a very old ‘consecration yew’ of Saxon provenance, with a broad, dead-looking trunk and a small bushy canopy. The tree has a long history and was first measured by Sir John Cullum in 1677 at 26 feet in girth. Re-measures through the years yielded the same result, which remains the same to this day. This represents a conundrum, because a growth stall of over 300 years should have killed it and the outer parts of the tree are in fact dead. The tree survives because it is growing inside its old trunk: a mass of strong and convoluted internal roots which support most of the branches. After three centuries like that the old trunk looks set to fall away and expose the new core that the tree has made for itself, except for a number of narrow runs of new vigorous wood which have inexplicably managed to grow up the old trunk surface like woody rivers. The work of the churchwardens and others associated with the churchyard has been exemplary, the tree has been suitably mulched to try to invigorate it and nothing has been cut off it. It has been able to regenerate in a fashion that no-one could have predicted; an excellent intervention for a temporarily somewhat parlous Saxon yew, which has worked very well. This incredible treasure was spared removal and is responding to gentle encouragement. TOBY HINDSON is a working horticulturist also engaged in long term empirical studies of yew growth, and a founder member of the Ancient Yew Group.